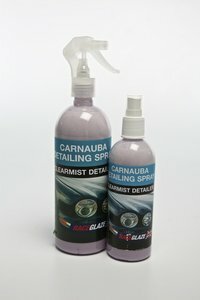 A very highly rated Carnauba wax spray-on liquid detailer. Cleans and waxes to enhance showroom shine and add protection between waxing applications. An easy spray-on wipe-off application for fast touch up on all painted surfaces. Leaves no white residue around badges, under bonnet, sills or on black plastic/rubber. Ideal for a quick finish when you arrive at events or in showrooms or when drying off. "I phoned your customer services at around 12 oclock yesterday, and they told that a replacement item would be despatched to me as confirmed by your E-Mail. I am pleased to inform you that the new item arrived at my house at 9 oclock this morning. Thank you, and kind regards to you and your colleagues for your prompt action. Couldn't be any better. "HAPPY NEW YEAR " to you all "